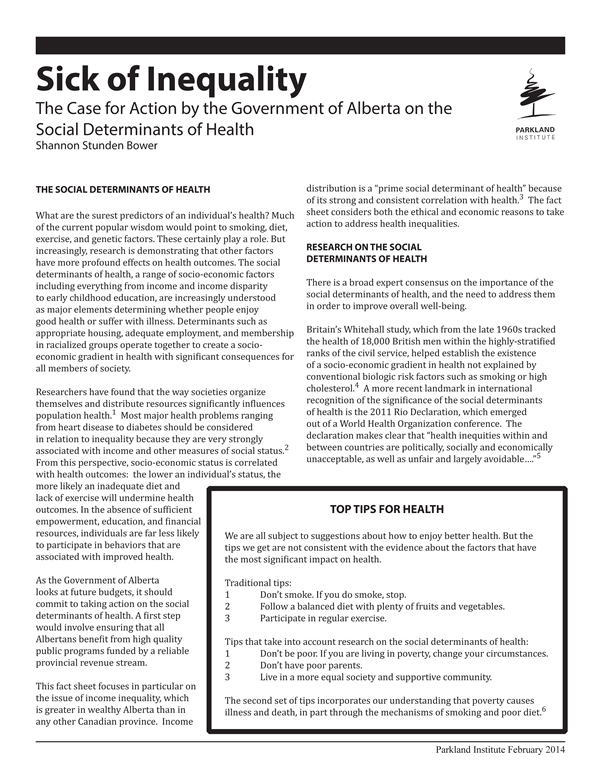 Using the framework of social determinants of health, Sick of Inequality looks at growing inequality in Alberta (currently the highest in the country) and quantifies the financial costs of that inequality. In particular, the fact sheet looks at how government policies aimed at reducing inequaltiy could drastically improve health outcomes in Alberta, and exactly how much money we could save in health care costs. What are the surest predictors of an individual’s health? Much of the current popular wisdom would point to smoking, diet, exercise, and genetic factors. These certainly play a role. But increasingly, research is demonstrating that other factors have more profound effects on health outcomes. The social determinants of health, a range of socio-economic factors including everything from income and income disparity to early childhood education, are increasingly understood as major elements determining whether people enjoy good health or suffer with illness. Determinants such as appropriate housing, adequate employment, and membership in racialized groups operate together to create a socioeconomic gradient in health with significant consequences for all members of society.